I love it when I find great places inside of gas stations. 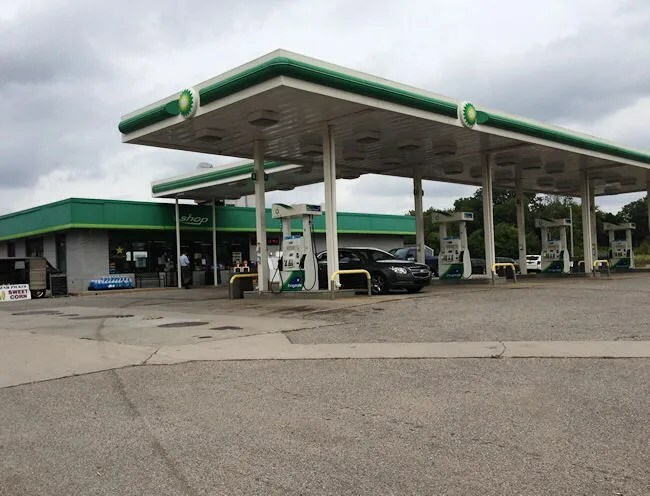 For several months, I have stopped at the Ridderman Oil and noticed some kind of counter that popped up quite a while ago. I usually just grab a Pepsi up front and have never gone back to see what is actually there. This past week, I saw a sign out front that the special for the day was a dollar off a pulled pork sandwich. I love pulled pork sandwiches, so I walked back to the back of the gas station to see what this deli was all about. The deli is a small counter tucked in to a space near the back portion of the store. 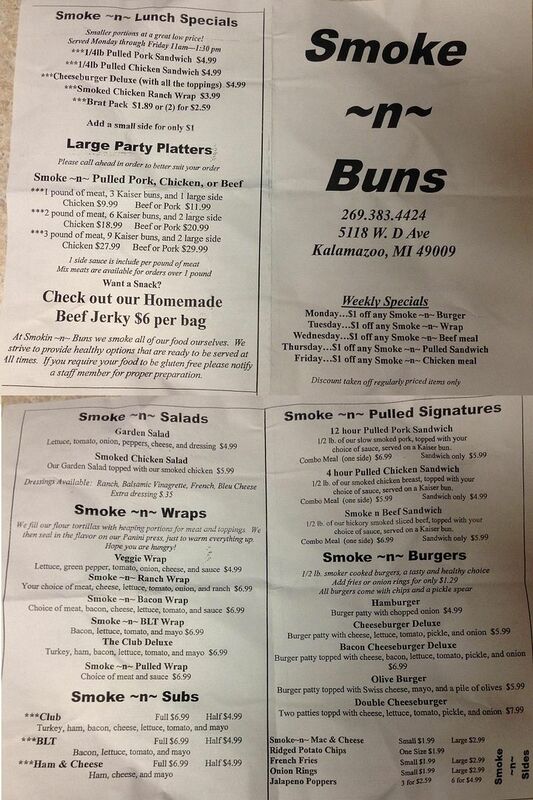 The menu is pretty simple consisting of sandwiches and sides that are easy to eat on the go. When I walked back there, a lady in front of me had just ordered a salad. 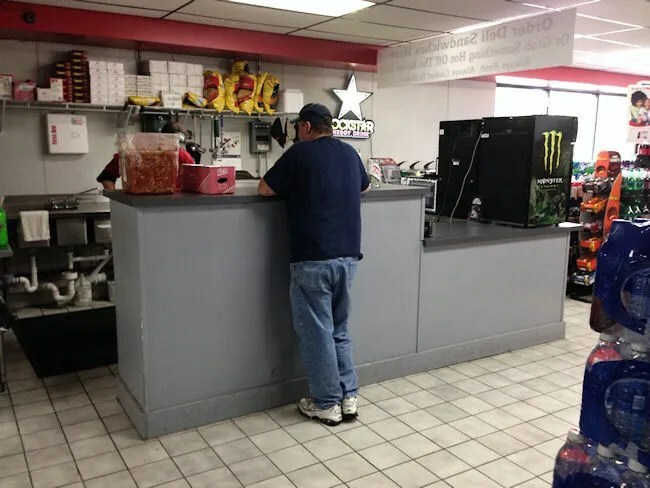 The lone employee told me to pick up a menu and he’d be with me in a minute. It took an awfully long time to make the salad, but there was a really good reason for it. He was pretty much chopping everything fresh for the salad. Nothing was pre-made. He was chopping tomatoes and chatting with the lady whom he seemed to know. Once it was my turn to order, I asked for the pulled pork sandwich and an order of fries which would have been a combo. Unfortunately, the fryer was down that day and he wasn’t able to make any fried food, so no fries. I then asked for Mac ‘n Cheese, but there had been a big lunch rush due to some construction workers in the area and he was out of that as well. The only other option was chips and they were just out of the bag type chips, so I passed and just grabbed the sandwich. It seems like everything at this little spot is home made. While the bun was being grilled on the panini press, the chef pulled out a big piece of pork but and started pulling off pieces of pork for the sandwich. 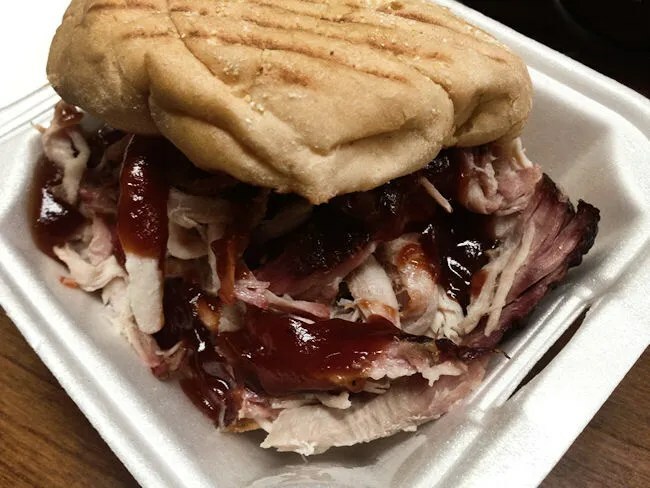 Once the bun was thoroughly toasted, he piled on the pieces of pork he just pulled off then topped if off with some sweet BBQ sauce poured out of a giant GFS bottle. The cost for the meal was just under five dollars. I grabbed a bottle of Pepsi from the cooler then headed to the cash register for the gas station to pay. I was on my way to work when I stopped in, so I couldn’t eat until I got to Grand Rapids. The sandwich attracted quite the crowd when I sat down to eat. Many of my co-workers could smell the BBQ down the hall and they went to investigate that delicious smell. The meat was delicious. So tender and juicy. The grilled bun just added a little bit of crunch to the sandwich was was very sweet from the little bit of BBQ sauce and just a little bit salty from the pork. 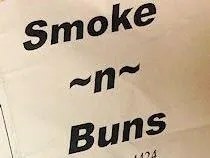 Smoke~n~Buns is a little bit of a hidden surprise. The sandwich was delicious. It seems like almost everything is made from scratch. The pulled pork I had was fantastic. It’s pulled pork the way I make pulled pork which, of course, is something I really like.